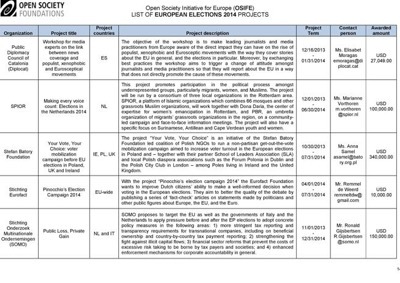 In 2014, George Soros’s Foundation, Open Society Initiative for Europe, funded organizations fighting for the independence of Catalonia. This is what La Vangardiarevealed last year (2016). 27,049 dollars to the Consell de Diplomàcia Pública de Catalunya (Catalonia’s Council for Public Diplomacy in Catalonia), an organization that Catalonia’s Generalitat [Translator’s note: this is the institutional framework for Catalonia’s independence] established with different private partners; and – 24 973 dollars to the Centre d’Informació i Documentació Internacionals a Barcelona (the Barcelona Centre for International Information and Documentation, which we will call “BCIID”). BCIID is an independent think tank. The BCIID is playing the role of the Premier Minister and Minister of Foreign Affairs for the “Generalitat of Catalonia”. It is defending every issue from the same perspective as Hillary Clinton.